Mina A' Salam is a grand boutique hotel of immense charm and sophistication. Literally translated, Mina A' Salam means the harbour of peace' and the sea-faring heritage of Dubai is evident in the detail and design of this delightfully appointed hotel, its harbour and its intricately landscaped gardens. This luxury hotel offers guest a free access to the famous Wild Wadi Water Park. It features an indoor and outdoor pool, free Wi-Fi, and spa. All rooms come with a balcony. 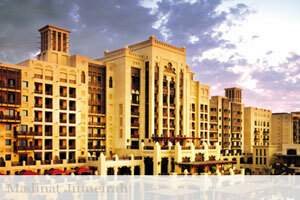 At Mina A Salam Madinat Jumeirah accommodations have large floor-to-ceiling windows and natural dark wood furnishings. They come equipped with air conditioning, TV and minibar. Some rooms offer panoramic views of the Arabian Gulf. The Mina a Salam provides guests with several international dining options. Moroccan cuisine is served at Shoo Fe Ma Fee. The Magnolia offers vegetarian dishes. There are also several bars. Guests can benefit from Mina A Salam Madinat Jumeirah’s gym and enjoy a game of tennis and squash. The hotel’s Talise Spa offers massage treatments. Dubai Media City is a 10-minute drive from Mina A Salam. The hotel offers free parking and an airport shuttle can be arranged on request.